It’s the end of the evening and you’re packing your child’s book bag for the next school day, when you notice a medium-sized piece of red construction paper at the bottom of the bag. As you reach down and pull the paper out, a smile crosses your face because of what you find—a little, heart-shaped card that reads “Happy Valentine’s Day To The Best Family In The World,” written in crayon, by your child. And you silently think to yourself, “That’s sweet and so very true.” But with all the responsibilities and challenges you face as a special needs family, it’s easy to forget at times. However, with a proper mindset and a positive attitude, 2017 can bring a renewed appreciation for your family and a brighter future for everyone. And best of all, you can enjoy yourself just like any other family. There’s no getting around it, your child’s disability has changed your life and that of your family. But nobody gets the life they expected. Read the newspapers, listen to the radio or television or visit online news sites. Every day there are examples of how, in the blink of eye, a family’s life changes. Lightning strikes, plans don’t work out, things change. Everybody, with or without a child’s disability in their lives, ends up in a place they didn’t expect. The trick is to do the best with the life you have. Valentine’s Day isn’t just about romantic love. It’s also a time to appreciate ALL the love in your life. With the right outlook and a solid support system, you’ll have a good life, and so will your whole family. Yes, you have a son or daughter with a disability. Your cousin may have a teenager who is a high school drop-out, doesn’t want a job and won’t lift a finger to clean the house. Your neighbor may have rebellious daughter with blue hair who won’t stick to her curfew and hangs out with a bad crowd at school. Just know, everyone has challenges; some more obvious than others. There are no picture-perfect children or families. You and your family have overcome more than most, and you should be proud! Be sure to take pictures or videos on your cell phone of your family activities throughout the year. Create refrigerator magnets of family photos. Make your favorite family picture a screen saver on your computer or cell phone. Involve the entire family by printing your photos and making a collage that can proudly be displayed in your home. And when you look at it, remember the good times. And don’t forget the siblings. It has been said that every child has “special” needs. 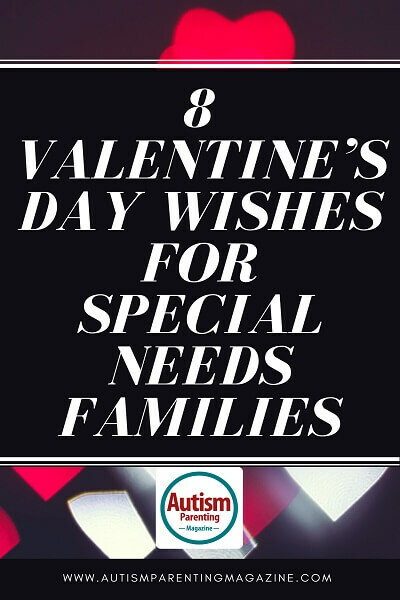 Whether or not they have a disability, all children need and deserve the love and support of their parents, and to know they hold a special place in their parent’s hearts. So, be sure to encourage your other children, show a sincere interest in their lives, and voice your appreciation for their role in your special family. It’s hard enough raising a child with special needs without the whole world watching, staring, passing judgements and making comments. It may be difficult for you and other family members not to feel self-conscious or anxious about taking your child out in public or participating in events. But the bottom line is that a child with special needs often looks and behaves differently, and that will attract attention. Your son or daughter cannot control his/her inappropriate behavior, any more than a person with one leg can stop limping. You and your family must always remember that if people lack understanding or sensitivity, they are the ones in the wrong, not you. As simple as it sounds, just being together can promote closeness among family members. These days, with everyone’s hectic schedules, it’s rare to find time to relax and be with one another. So, make it a point to set aside time for your entire family to spend together, on a regular basis, even if it’s only for an hour. Have a simple family dinner, once a week. The most important thing is to be present and engaged when together. So that means everyone’s cell phones and electronic devices should be placed in another room so there are no distractions. Once done, everyone can enjoy a good meal and talk about the day’s activities, upcoming plans or anything else that comes to mind. You’ll be pleasantly surprised how these simple gatherings can make everyone feel closer together. Take time to appreciate everyone who is part of your family, for they are the ones who make it unique. Celebrate the distinctive qualities that make each person special. Start a new family tradition where each month you do something nice for an individual member. It can be as simple as buying a toy for your child, flowers for a spouse or taking over someone’s household chores for one or two days. A disability doesn’t define your child and it shouldn’t define your family. Don’t allow the disability to be the center of your family’s life. Focus on the greater good and well-being of the entire family. It’s important to listen and speak respectfully to each other. Support one another in good and difficult times. Give a hug, a kiss, a high-five or pat on the back. Say “I love you” or “You’re the best little sister I could have.” Send a text to say “Thinking about you,” or “Hope you’re having a good day.” Whatever works best for your family. Just remember to express your feelings and affection for each other. Knowing you’re loved and valued makes a family unit closer and stronger. Look for ways to create projects that everyone can participate in. Paint the living room, plant a garden for the Spring or make plans for a family vacation. Have family members teach your special needs child simple household skills based on his/her ability to learn. With everyone working together toward a common goal, a sense of belonging and team spirit will develop in the family. Participate in hobbies and activities or attend events that are enjoyable for the entire family. Going to the movies can be entertaining. Some theatres now offer special show times for families with special needs children and adults. During the movie, the settings are adjusted so families and their children can do whatever feels appropriate for them. In this comfortable and stress-free environment, you don’t have to worry about upsetting other moviegoers and can actually sit back and enjoy the show. And who knows? You might even meet other like-families in your area or find a new playdate for your child. Every family needs something to look forward to, especially in the cold, winter months. Now is a perfect time to plan a summer vacation or other activities that everyone will enjoy. Buying a season pass at a favorite amusement park can ensure months of family fun. Some water and amusement parks even provide day passes for individuals with special needs that allow them to go to the front of the lines at rides. In addition, there are nice perks. One or two family members are often permitted to join them as well. Deanna Picon is the founder of Your Autism Coach, LLC, which provides personalized guidance, comprehensive support programs and seminars for parents of special needs children. Her personal mission is to empower parents as they advocate for their children, while balancing productive work and family lives. She received her BA in psychology and BA in broadcast journalism from Syracuse University. Deanna is a parent of a non-verbal, young man with autism. She is the author of The Autism Parents’ Guide to Reclaiming Your Life. Deanna can be reached at www.YourAutismCoach.com or @yourautismcoach.